The governor has promised to hold people accountable, but here's who dropped the ball...and isn't facing any penalties or discipline yet. TAMPA BAY, Fla. – After 84 days of SunPass account disruptions, billing errors, and customer service nightmares, it still does not appear as anyone at the Florida Department of Transportation – or the firms in charge of managing the SunPass system overhaul – has faced any accountability yet for a lack of oversight that has impacted millions of Floridians. FDOT announce fines to the contractor in charge of the project, Conduent, this month. But the $800,000 penalty only came after nearly two months of 10Investigates questions to Gov. Rick Scott, and it represents less than a quarter of one percent of Conduent’s $343 million contract. In addition to Conduent's massive information technology failures, several FDOT and Tallahassee insiders tell 10Investigates that project managers erred by not switching back to the old system when the new one collapsed. Additionally, the decision not to run their old system in parallel with their new system proved to be a costly one. But weeks of 10Investigates questions about accountability for the engineering firms contracted to supervise the system upgrade, HNTB and Atkins went unanswered. This week, for the first time, an FDOT spokesperson said the agency's legal office would review its contract options. Governor Scott also recently said he would request an inspector general investigation, but no details have been provided about when it would begin, how long it would take, or how broad the scope would be. Governor Scott and FDOT have been blaming the entire SunPass meltdown on contractor Conduent, but the state is paying engineering company Atkins millions of dollars as a general consultant and supervisor on the project. Atkins employees were so integral to the project, some were given FDOT email addresses. In fact, emails obtained by 10Investigates reveal the final sign-off for Conduent to launch the new system came from Atkins, not FDOT. One of Atkins’ managers on the project is a former Conduent regional vice president. But somehow "back office" systems - that should have been thoroughly tested prior to launch - failed. And the problems were similar to problems Conduent experienced with tolling projects in numerous other states. Atkins has a long history of working as FDOT’s general consultant projects around the state. An online search of state contracts yielded nearly 200 Atkins agreements with FDOT, worth approximately a billion dollars. The firm also has close ties to Gov. Scott, donating $25,000 to the governor’s political committee, Let’s Get to Work, ahead of his 2014 re-election campaign. 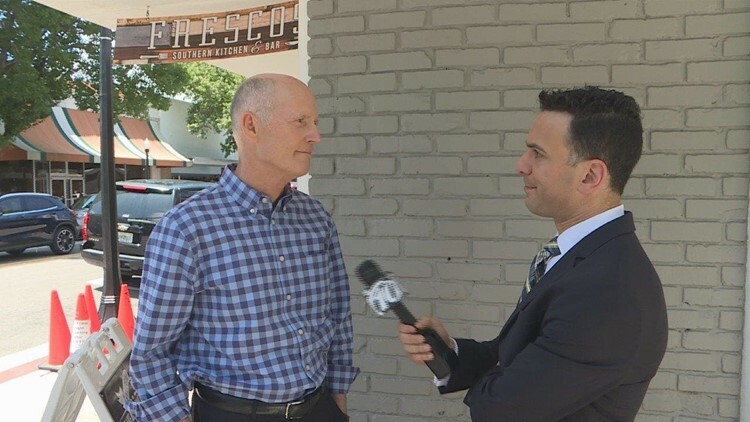 "Anybody who wants to contribute," Scott told 10Investigates in early August, "knows exactly what I stand for and what I'm going to do...I don't work for special interests (and) I'm doing everything I can to make sure there are no conflicts of interests." Scott has appointed a number of Atkins executives to state boards, including the university system’s Board of Governors, the Public Service Commission, and Environmental Regulation Commission. Atkins did not provide any comment for this story when requested. The company continues to collect payment on its contracts with the state. Numerous observers of the recent SunPass collapse at the hands of Conduent have asked why the company, which had experienced major tolling problems in a half-dozen states prior to Florida, got the contract in the first place. Ken Wright, a Gov. Scott appointee to the Florida Transportation Commission, said it "boggles the mind" that the state chose Conduent. The Request for Proposal (RFP) was managed by engineering firm HNTB, a firm with a history of more than 100 FDOT contracts worth hundreds of millions of dollars. But the fateful 2015 decision to choose Conduent for the $287-million SunPass system upgrade, which has grown to $343 million since was a controversial one. Two of the four unsuccessful firms protested the procurement. And in a rare move, FDOT paid more than $3 million to the Cubic company to settle its protest. The contract FDOT signed with Conduent was also criticized by Florida's Bureau of Auditing for lacking appropriate accountability measures and financial consequences if Conduent fails to perform in accordance with its contract. 10Investigates also found $21,000 in HNTB campaign donations to Democratic-controlled committees since 2013. HNTB also lobbies Tallahassee with high-powered lobbyist Brian Ballard, one of Gov. Scott’s friends and top fundraisers. 10Investigates requested a list of visits from lobbyists to FDOT, but the agency said no list exists. A spokesperson for HNTB referred all questions and requests for comments to FDOT. The company continues to collect payment on its contracts with the state. Questions to industry insiders, lawmakers, and FDOT employees regarding the lack of accountability at FDOT and with FDOT vendors tend to always come down to the same opinion: road-building is a small, “incestuous” business where employees tend to shuttle back and forth between public and private organizations in search of their next big opportunity. FDOT employees tell 10Investigates their bosses are scared to hold contractors accountable, for it could affect their professional future. And private companies are hesitant to ever speak out against industry leaders, for fear of getting blacklisted. The most prominent revolving door was that of Scott-appointed FDOT secretary Ananth Prasad, who previously worked as vice president of HNTB after at one time working for FDOT. In January 2015, Prasad left FDOT to once again go to work for HNTB. In the weeks leading up to his departure, Prasad’s FDOT awarded a lucrative three-year contract to HNTB to consult on the state’s driverless car future. Even though it was made public immediately after his FDOT departure, the agency said Prasad had nothing to do with the procurement. Issue: Downplaying of problems; deceptive press releases; slow response to questions & records requests. Concern: Floridians had no idea how bad the SunPass failures were until 10Investigates broke the news on June 19 that the state was unable to process tens of millions of toll transactions. It was another week before the state even acknowledged problems, and it continued to try and downplay the severity of the system disruption. No public notice was given when dozens of drivers’ personal data was accidentally compromised in July. Response: In the two months since 10Investigates' first report on the failures, FDOT has not gotten much more forthcoming with information. The agency refuses to acknowledge interview requests and has even sent simple records via U.S. mail, seemingly to try and delay their release. They have sent deceiving press releases out to try and control the media's messaging. And the public still has no explanation -- outside of 10Investigates' reporting -- of how six million customers were inconvenienced so badly. For the first time Tuesday, the agency provided a number of documents and answers that were requested by 10Investigates, some more than a month earlier. Issue: The technology meltdown limited access to SunPass accounts, the SunPass website frequently crashes and billing was delayed by weeks and months. Concern: Customers couldn't access receipts to get work reimbursements, got hit with large and unpredictable charges when tolls finally were processed, and the delays mean account errors are very difficult to spot and correct. Response: FDOT, its partners, and its vendors have been working around-the-clock to fix the computer issues, and they have announced there will be no fines or penalties on customers during the ongoing disruption. The toll backlog was finally cleared last week for many SunPass users, but EPass and Toll-By-Plate customers are still seeing long delays in billing. The state has rolled out its plan to reimburse customers for bank overdraft fees. But account errors -- of which there are multiple indications there are plenty -- are the responsibility of the customer to identify and report before refunds are issued. Concern: Some customers have to wait more than two hours to speak to representatives, and SunPass' promise to respond to emails within two days are going unfulfilled. Response: An FDOT spokesperson says extra staff members have been dedicated to customer service but has been unable to provide specifics over the course of the last two-plus months. In July, an agency spokesperson touted website improvements and Conduent's reduction of call center wait times. But, in August, the website continued to crash and call center wait times exploded as more drivers discovered unexpected and some inexplicable charges on their accounts. Issue: Contractors and FDOT all had a role in system failures; state not in a rush to sort it out. Concern: Are contractors incentivized to get problems fixed fast? Will individuals who made big mistakes be disciplined? Will the state learn from mistakes to prevent it from happening again? Response: Last week’s announcement that Florida's inspector general would investigate came only after 75 days and four 10Investigates interviews with Gov. Scott. No scope has been announced for the investigation, but the governor's office said it would likely be "broad." Payments were halted to Conduent in late June, but 10Investigates revealed the company is still getting paid on other contracts. The state announced an $800,000 fine to Conduent, and it said the company will pay for customers' overdraft reimbursements as well. However, no fines or penalties have been mentioned for corporation Atkins, the general contractor responsible for oversight on the project, or HNTB, the corporation that oversaw the awarding of the contract to embattled Conduent in the first place. Issue: Customers who use toll-by-plate or other mail billing have not received bills yet. Concern: It appears the state has been unable to match all of the transactions to vehicle owners, delaying the posting of charges. Viewers are also reporting errors in plate identification, landing other drivers' tolls on their accounts. Response: An FDOT spokesperson has been saying for months all transactions will eventually be billed to customers "once quality assurance processes are completed." The state finally said this week invoices likely won't go out until October. ►Want to view an interactive timeline of the SunPass maintenance woes? Click or tap here.